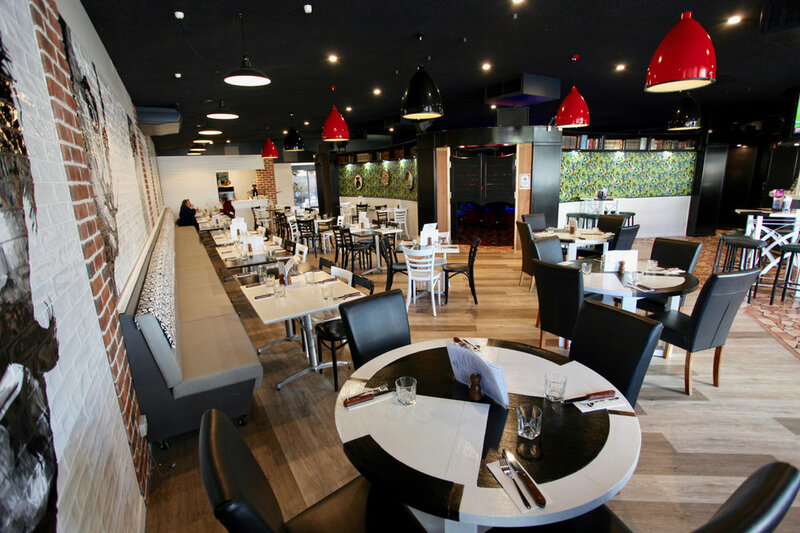 Craig Chandler Architects have designed a bright, contemporary facelift to the existing 1980's tavern on Oxley Road, Corinda. The brief for the hotel was simple, and called for a modest renovation of the time-worn outdoor dining space and entry, as well as a modern internal overhaul, to include new seating and wall features, and upgrades to the kitchen servery and bar. The rejuvenated outdoor dining area features a large gable truss extending across the width of the venue, transforming the space from a dark, shadowed pub into a bright and spacious sidewalk restaurant/cafe. By raising the roof and brightening the outdoor space, the pub appeals as a family-friendly venue once more. The new entry also allows much more light to filter through to the deeper spaces inside, providing maximum benefit with minimal impact to the existing structure. Credit goes to the client for the furnishings and the amazing artwork along the tiled feature wall, which now brightens the space and pops with fun. The materials chosen for inside bring light and warmth, as well as sophistication to the small space.